Boxing is a complex sport. Those of uswho love boxing love the action in the ring, and we often see the sport as a metaphor for life. Life is a struggle, a fight and for those who give up, success is never attained. Boxing has a history of wasted talent, crushed dreams and fighters who self-destruct. However, it also has a history of salvation and redemption. The life of veteran Brooklyn trainer Harry Keitt is such a story. Once a promising fighter, and a man who had sparred with the likes of Light Heavyweight Champion Dwight Muhammad Qawi and the great Muhammad Ali, Keitt soon found his life spiralling out of control. Harry Keitt began using drugs and, at his lowest point, shot his own cousin. After serving his time in prison, he rededicated his life to helping the young people of his community. He wanted to make sure that they did not make some of the same mistakes that have haunted him. He has spent close to 30 years making up for that one error in judgement. In that time, he has become a man who has taken on the job of trainer, mentor and surrogate father to many in his Brooklyn neighbourhood. He has become a respected individual due to his strength of character, his wisdom, and more importantly, he now possesses self-worth and dignity. How long have you actively been involved in the sport of boxing? In that time, what major changes have you seen in sport with regards to match-making and training? You have literally trained hundreds of fighters in your time. Do you have any favorites? Which fighters today impress you and have your attention? In the eyes of many of the young men and women you train, you are seen as a surrogate father, a mentor, an advisor, and a teacher. What is the most important lesson to try to impart on these young people? Knowing that not every person you train will turn professional or make a living as a boxer, how to you define your success as a trainer? You are presently training undefeated heavyweight Jarrell Miller. He is currently ranked 9th in the world by Ring magazine. What is it like to work with Jarrell and how far do you think he can go? Your personal story is one of redemption. Are you happy today with the path your life has taken? Harry Keitt presently works out of Mendez gym at 23 E. 26th Street in Manhattan, New York and trains undefeated heavyweight prospect Jarrell Miller. Miller’s next fight will be on April 28th at the Barclays Center on the under card of the Daniel Jacobs – Maceiej Sulecki fight. Harry Keitt readily acknowledges that he is an old school trainer. To him, that means teaching fighters to develop strong work ethics in order to become fundamentally sound. In a day and age when we sometimes see old as being passé, Harry Keitt is anything but. Honest, caring and knowledgeable trainers should be the norm, not the exception. He continues to preach to his young disciples – you need to be a champion to yourself. 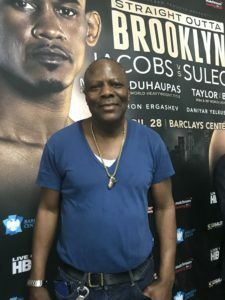 Although he may still possess some regrets about his earlier life, Harry Keitt has worked selflessly with the young people of Brooklyn and in return, he himself has become a champion. This writer had an old friend named Joe “Shannon” Schabacker who fought in the 1920’s and was trained by Jack Blackburn. Shannon bought Blackburn a new suit when he was ready to go to Detroit to meet the great heavyweight champion Joe “The Brown Bomber” Louis and his co-managers. He was well accepted and became the trainer of Louis. Shannon had many tales to tell including when one of the all-time great if not the greatest lightweight of all-time Benny “The Ghetto Wizard” Leonard walked into a banquet of boxers dressed to the hilt with his hands in his pockets. There was Frankie Callahan the former featherweight champion drunk as a skunk yelling over at Leonard. When Leonard finally got within arms-length of the loud mouth drunk with hands still in his pockets he simply said “what do you want some more of what I have you in the ring?” The drunk didn’t say a word. The best story Shannon told me was when he was still boxing and in the former world light heavyweight champion Philadelphia Jack O’Brien’s Gym in Philadelphia. The former champ and gym owner was well past his prime and in a suit. In one of the two rings O’Brien had in his gym was a boxer from New England who was in Philadelphia for a bout and working over one sparring partner after another one. “Don’t you have anyone here that can fight,” said the boxer. So O’Brien started to take off his jacket to get in the ring with him when Shannon who was only a lightweight and would be giving away about twenty-five pounds volunteered to get in the ring. He kept moving and the big mouth couldn’t catch him. Shannon jumped out of the ring. Well, the other boxer came over and got into the ring with the big mouth and went on to beat him so bad that one of his ear’s had a cut on it. He never said a word just got out of the ring knowing his bout would be postponed. Shannon followed the other boxer into the dressing room and said “hey thanks buddy for doing that for me.” The boxer said “I didn’t do that for you for guys like that don’t belong in the fight game. 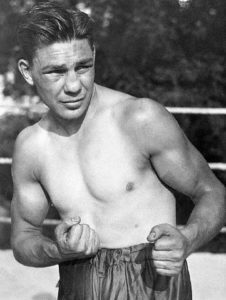 By the way my name is HARRY GREB. Yes, none other than the “Pittsburgh Windmill” and former middleweight champion who was the only boxer to defeat heavyweight champion to be Gene Tunney whose record was 79-1-4. It depends on where you look but Greb’s record has been known as 262-17-18, 260-21-17 and 107-8-3. The moral of the story is “watch what you ask for” because you might be getting more than you bargained for.